These muffins came about due to the abundance of pears coming in from my parents’ trees. 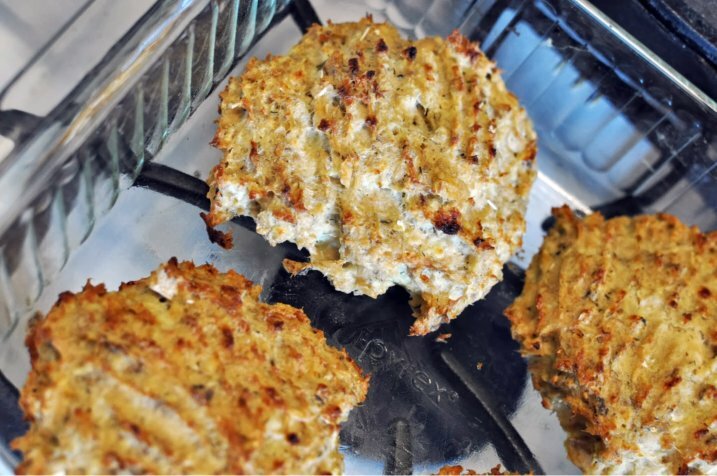 They are easy, chock full of spices and fruit, and I used a couple of alternative baking swaps like coconut oil and coconut sugar. 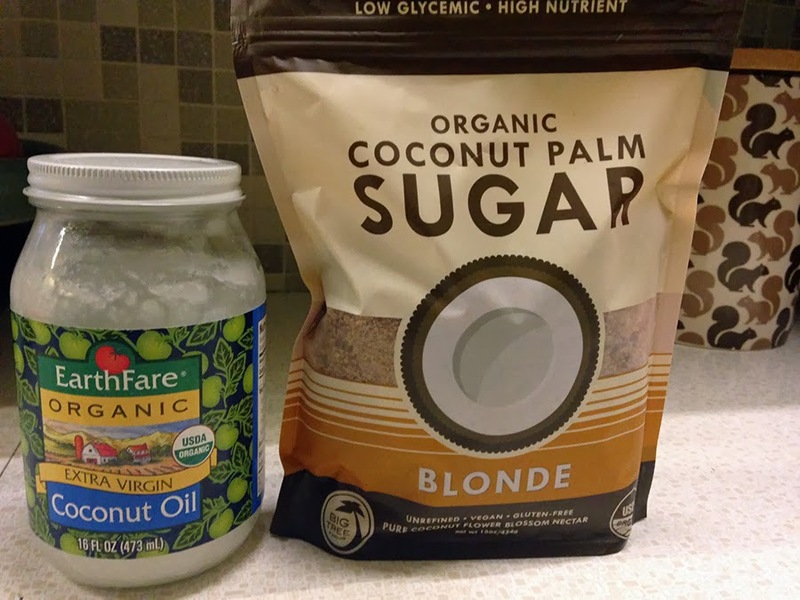 I simply swapped the 1/2 of cooking oil for 1/2 cup of coconut oil. Coconut oil is great – it can be a solid or a liquid and easily replaces other nut and vegetable oils. Even with all the recent health claims about coconut oil curing diseases, warding off bacteria, and being more heart healthy than other oils, remember it is still an oil, and limiting oil intake is still a smart idea. I also swapped out the 1/2 cup white refined sugar for 1/2 cup coconut sugar. Again, this coconut sugar is still a sugar, and while it does retain more of the nutrients from coconut such as zinc, iron, potassium, and calcium, you’d still receive more benefits from eating just the pears shown below. Also, if you use Truvia Stevia, check out this article. Bottom line: baking sweets with alternatives is still baking sweets. 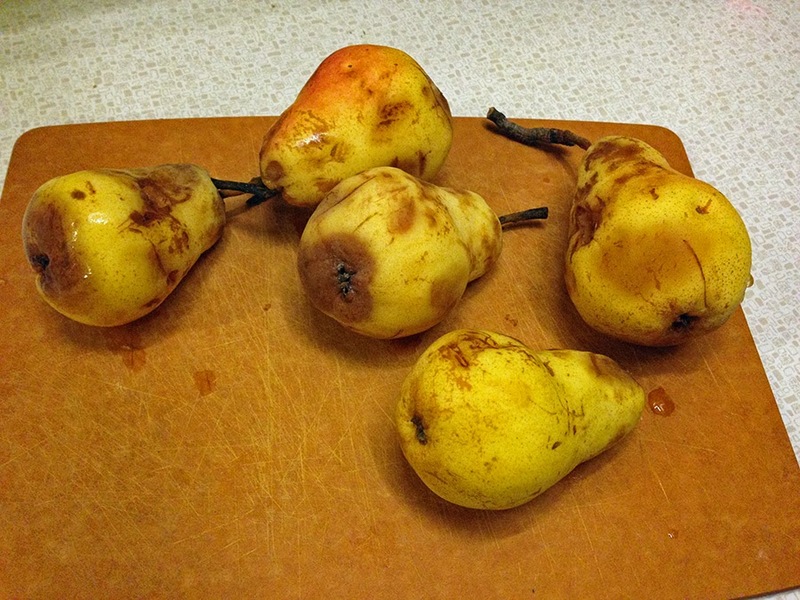 I used 5 very ripe pears – the bruising is not a problem at all. Just cut away the parts not needed, peel, dice, and use. The batter of this muffin mix is very thick. The addition of the pears will create some extra juices. Whenever I add fruit to my baking, I always add a little more time on to the baking time to avoid those pockets of uncooked dough. 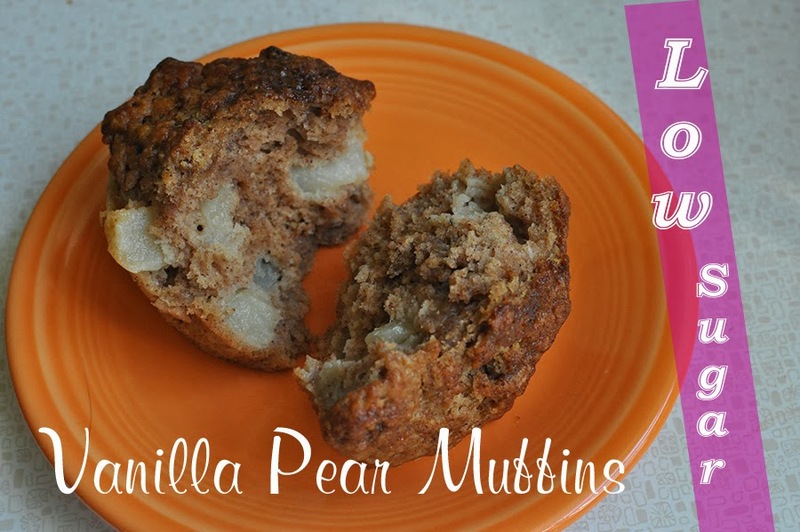 Low-Sugar Vanilla Pear Muffins – makes 14 standard size muffins. Adapted from Williams-Sonoma Muffins. 1. Preheat oven to 350 degrees. 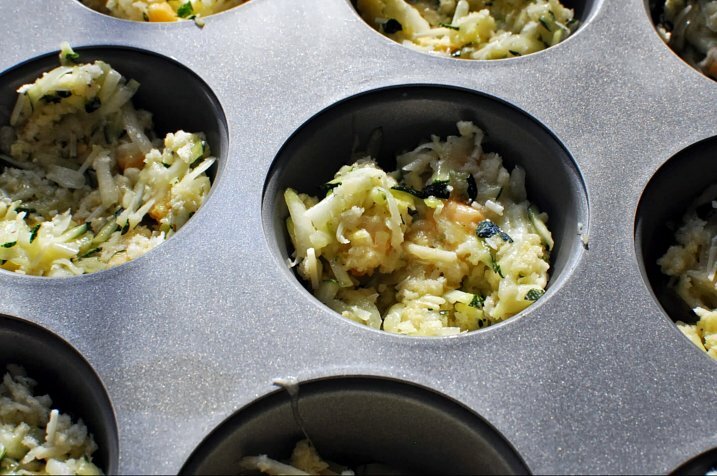 Grease or line 14 standard size muffin cups; fill unused cups 1/3 of the way with water to prevent warping. 2. In a bowl, stir together 2 cups flour, 1/2 cup coconut sugar, 2 teaspoons ground cinnamon, 1 teaspoon nutmeg, 2 teaspoons baking powder, 1/2 teaspoon baking soda, 1/2 teaspoon salt. 3. In another bowl, whisk together 2 eggs, 1/2 cup (warmed, if you house is cold) coconut oil, 3/4 cup buttermilk (made of almond milk), and 2 teaspoons vanilla. Make a well in the dry ingredients, add liquid ingredients in a few swift strokes. Do not over mix, batter should be lumpy. 4. Peel, core, and chop 4 – 5 ripe pears. Fold into batter gently. 5. Spoon batter into prepared muffin cups until level with rim. Mix topping: 2 tablespoons coconut sugar and 1/4 teaspoon cinnamon, stir well. Sprinkle topping over batter. Bake for 20 to 25 minutes, or until golden, dry, and springy to the touch. Allow to cool in pan for 5 minutes, then remove. I love baking. I try to keep it as dairy-free as possible for the lactose intolerant people in my life (including me to a small degree). 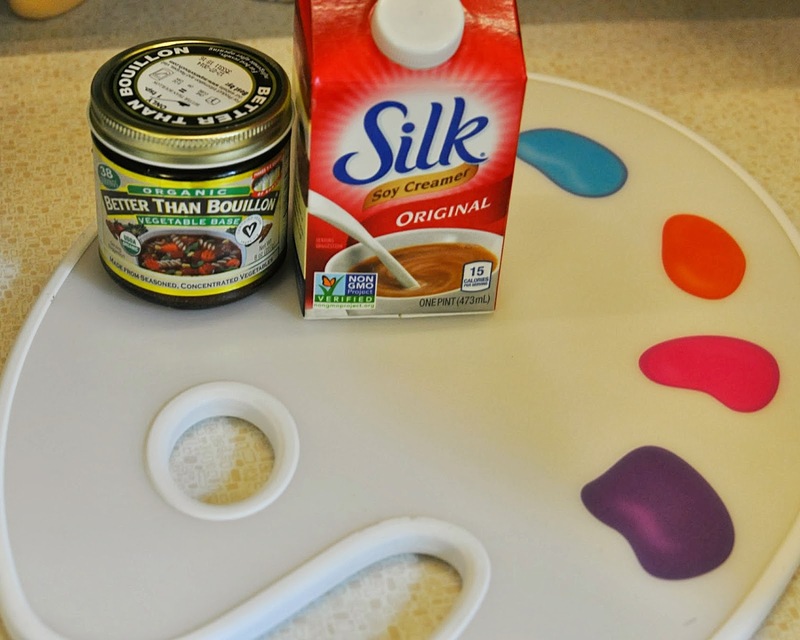 Milk is the number 1 pain-inducer for me, so we made the switch to soy milk years back. Eventually we found our way to almond milk, which in my opinion has a far superior taste. 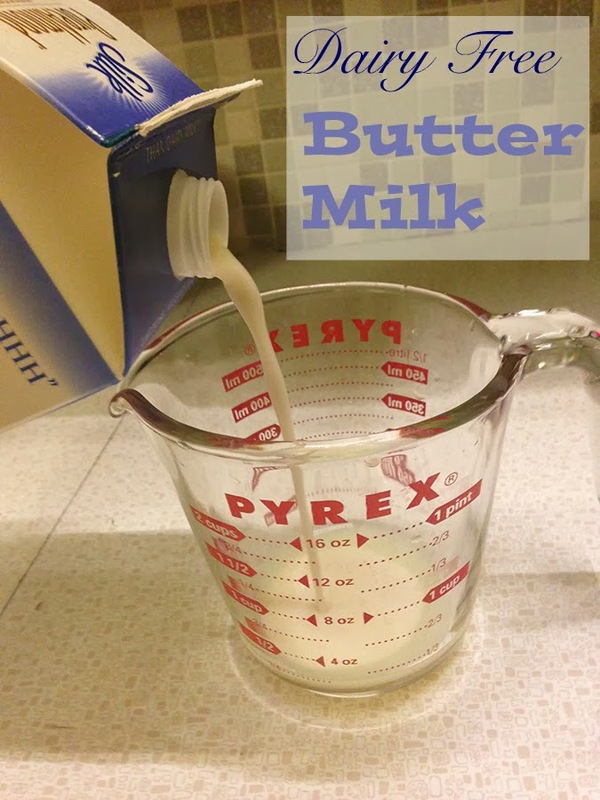 Did you know you can make your own buttermilk from any dairy-free milk replacement? 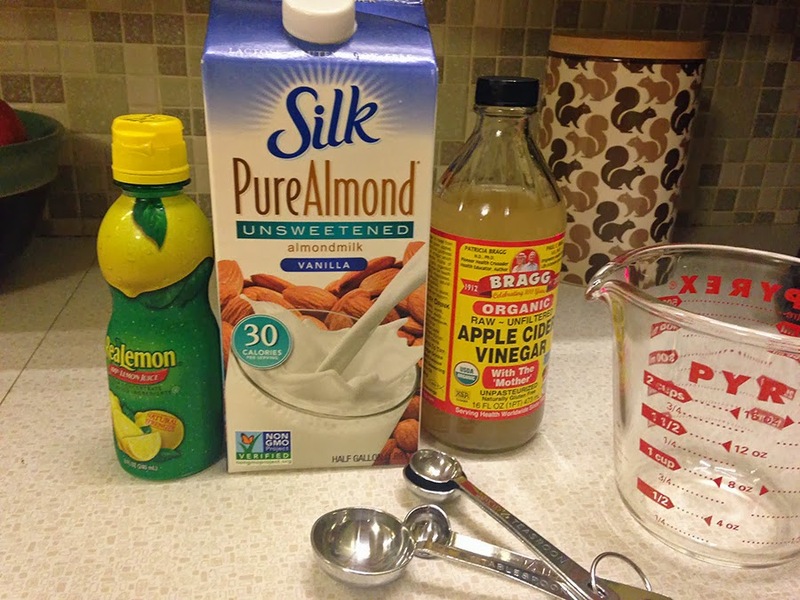 All you need is your dairy-free milk and either lemon juice or vinegar. Put 1 tablespoon lemon juice or vinegar into a glass measuring cup. 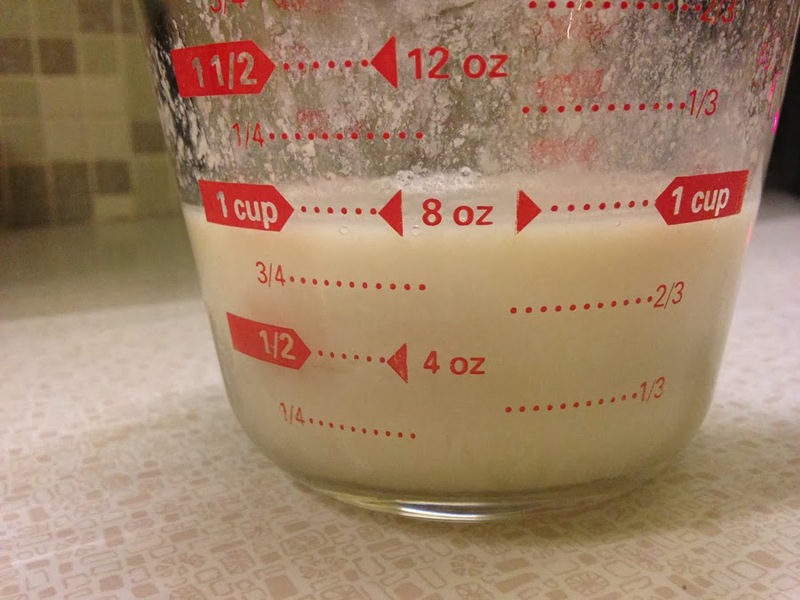 Pour enough dairy-free milk in to fill to 1 cup. Allow to sit for 5 minutes before using in a recipe. Enjoy! 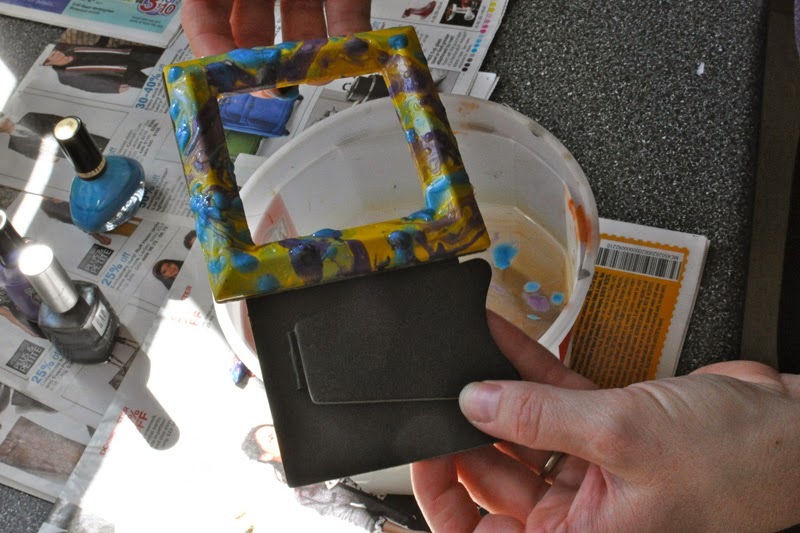 Talk about a fun, easy, and cheap project! This occupied my evening last night until far too late. It was one of those evenings – out with friends and home with every intention on going to bed, but alas, art got in my head instead. Once I am set on a project, I have to complete it, or it just completely takes over my brain’s functioning ability. I started with 3 cheap frames from a dollar bin at a big box store. The yellow was a nice color, but since they were from the dollar bin, the paint job was cheap and chipping off. Nothing some paint wouldn’t fix! Next, I rummaged around and found some of my cheaper and dying nail polishes. Then I filled a bucket, big enough to fit the surface of my frames, with water. 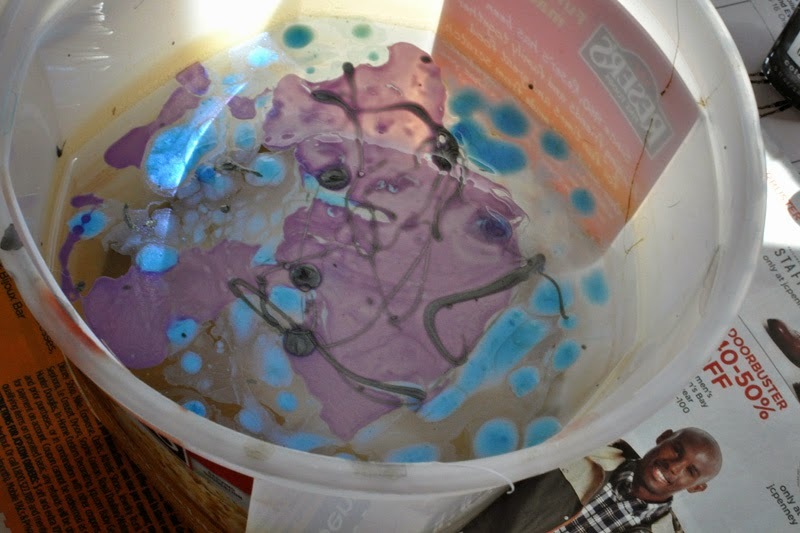 Then, carefully poured a mixture of nail polish colors onto the surface of the water. If you pour too fast, some of the nail polish will pop back up to the surface of the water. Once the design was complete, I dipped my disassembled frame carefully just onto the surface of the water. Then, I quickly lifted the frame straight up, so as not to ruin the design on the surface. Here is the marbled design of the first frame. 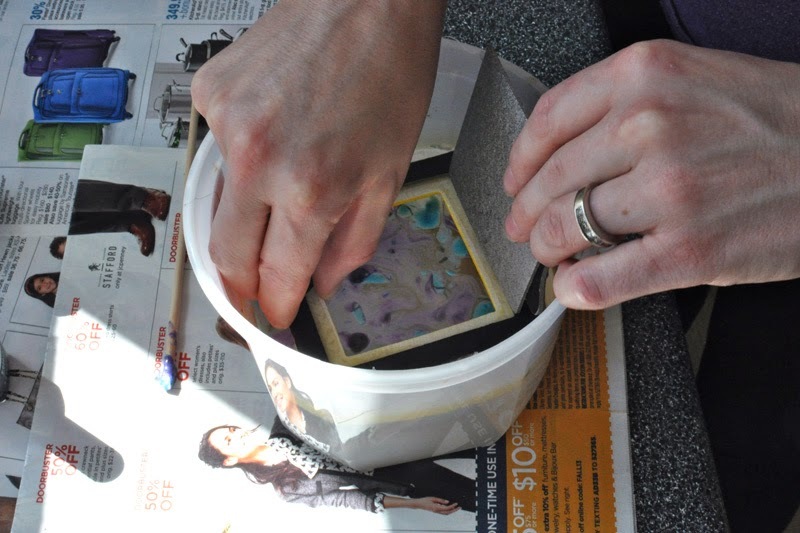 Allow the frame to dry on newspaper for an hour, at least. Keep using the same water, just use a piece of folded newspaper to skim the nail polish off the surface and then add new colors. 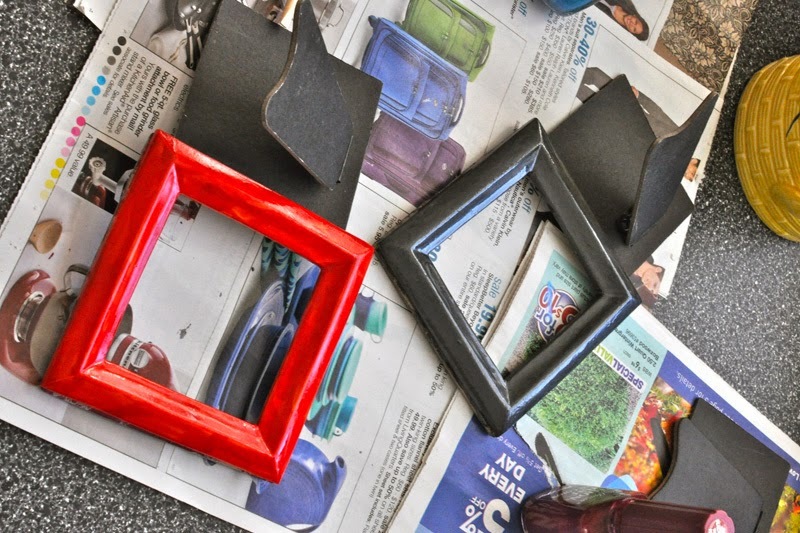 For my second two frames, I decided to create a new base color with red and dark silver nail polish. 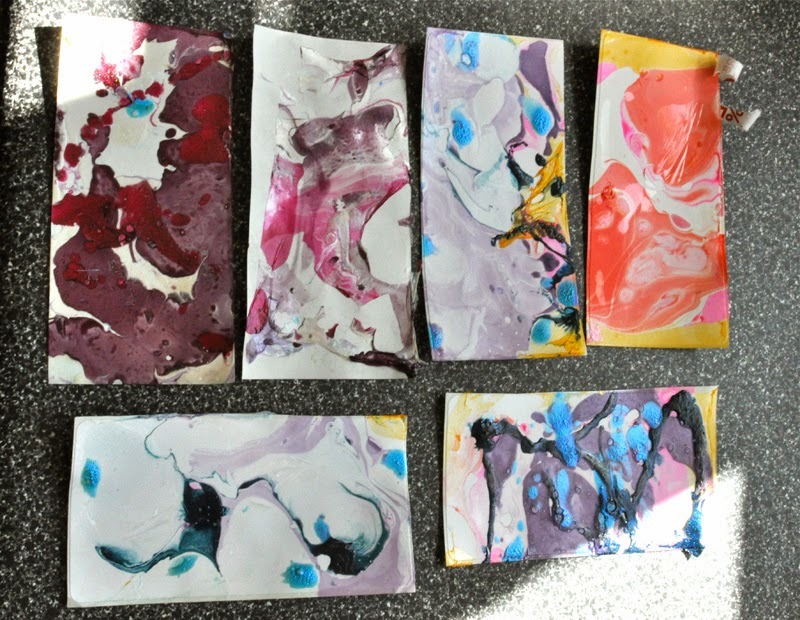 After the base coats were dry, they too were marbled. 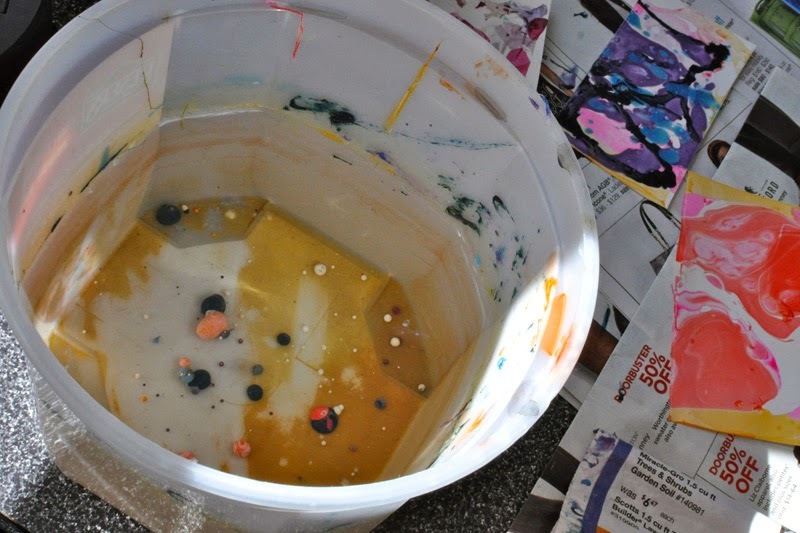 The water bucket will have droplets of remaining nail polish leftover at the bottom and edges. This is why it is important to use a disposable container. When I was completely finished, I poured the water into a trash bag that was already full of trash that would soak up the water. Do not pour down drains or flush this water! 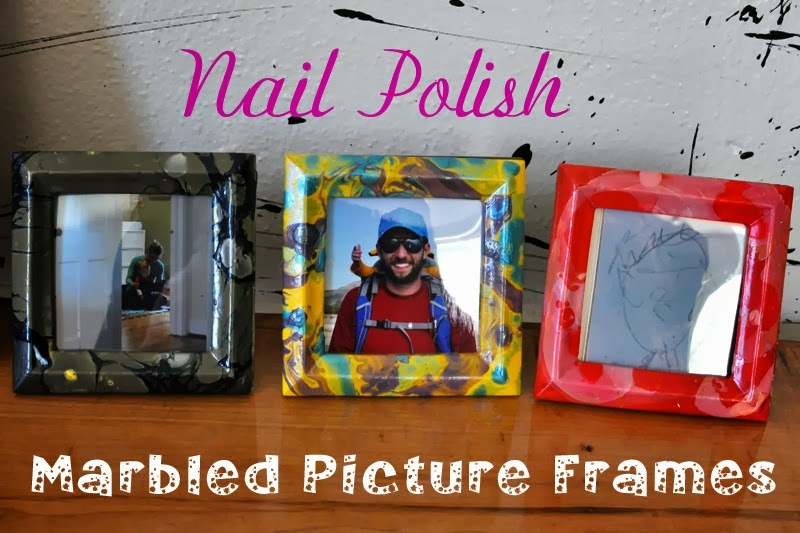 I created some marbled sticky labels after the frames were done. 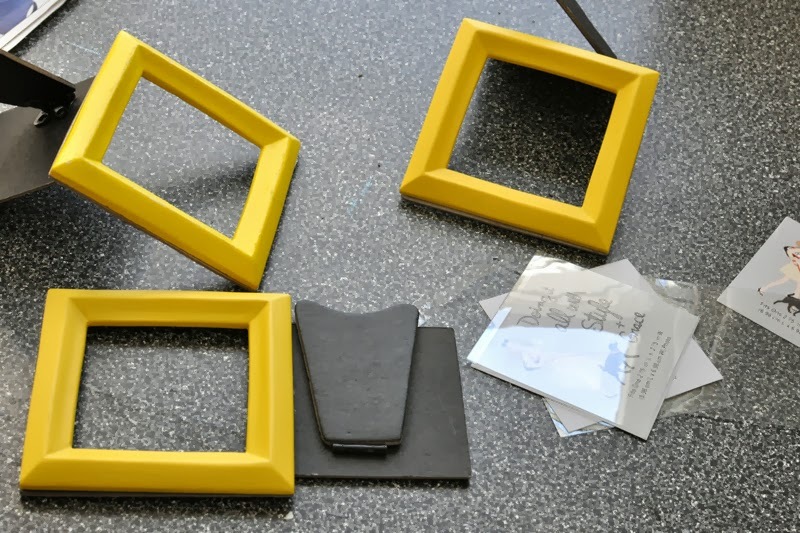 I plan on using these to label boxes and bins to keep my art room organized. 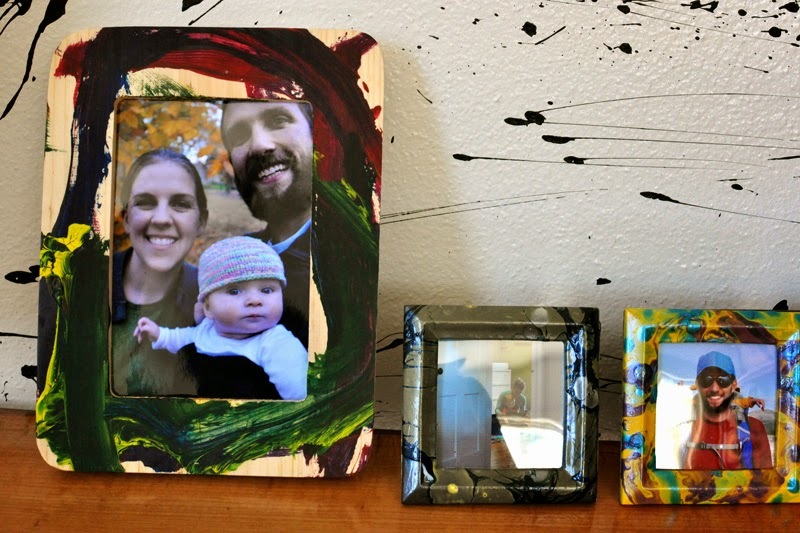 The frames look great alongside Greta’s abstract painted frame that she painted for me. This soup is the perfect cure for the end of summer to beginning of fall blues. Kind of miss the pool with the lingering hot days, but loving the cool sweatshirt nights? Yeah, me too! I used some leftover corn on the cob to make this corn and sweet potato chowder – it’s something I have been thinking about for a few days now. The best part is it used up quite a few of the veggies I had sitting around, fearful of letting go to waste. The other nice part? Dairy & animal free. Sometimes I just need something that is vegan. I know, some of you are probably scratching your head. However, sometimes I also just need something animal derived. I do what my body tells me to do (within reason). That paint palette cutting board was a gift from my new art teacher colleagues! 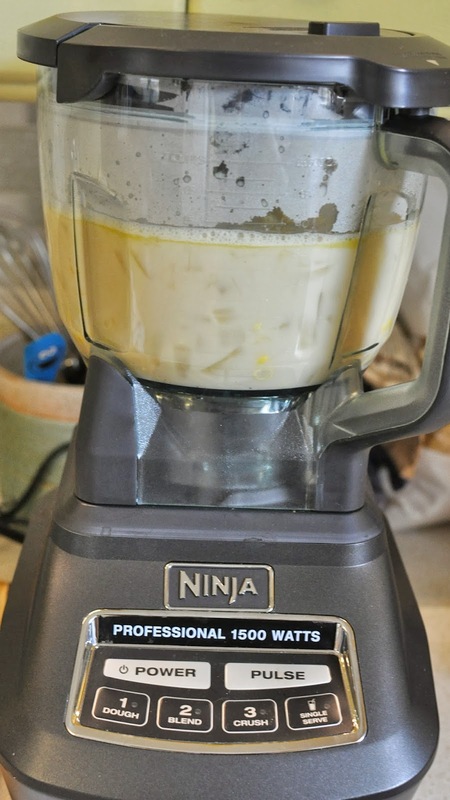 Trusty Ninja purees soup with ease. Just be sure and let it cool a bit, and make sure the lid is on tight, and make sure a fragile toddler isn’t near by to watch it loudly explode in the kitchen. True story. I had some double clean-up that night – tears and spilled soup. 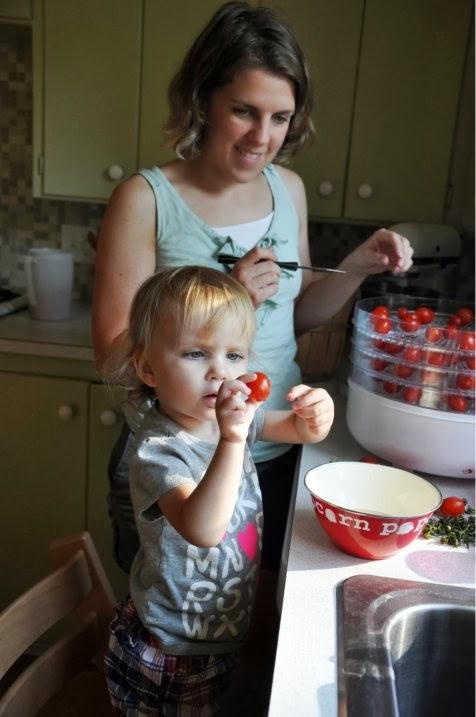 She is quite the kitchen helper these days though. 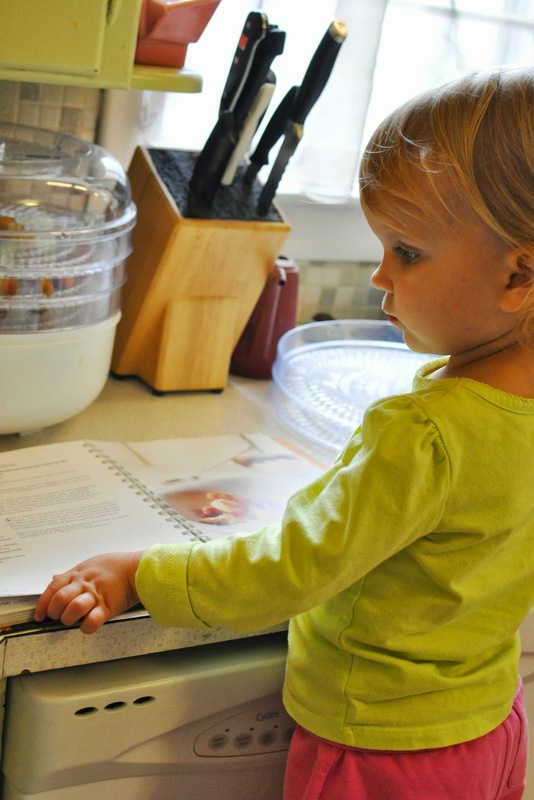 Flipping through the cookbook is a new favorite activity, all the while asking me, “What this?” at every photograph. 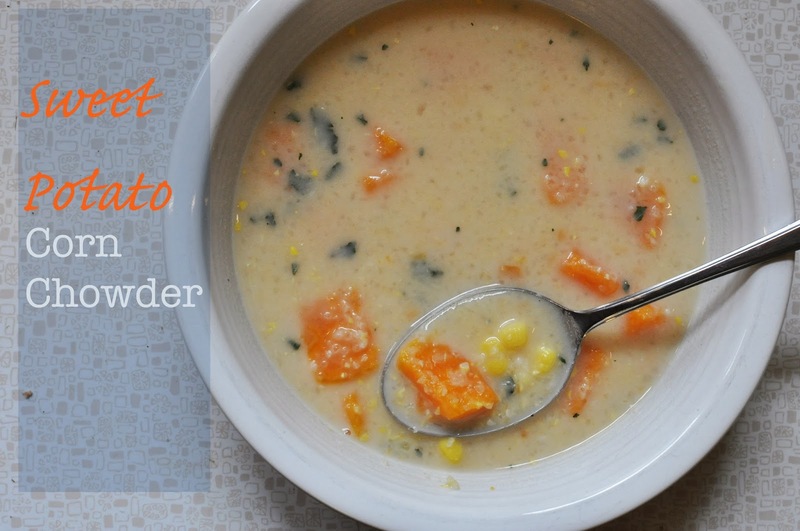 Sweet Potato Corn Chowder – makes 6 – 8 servings. Adapted from Better Homes and Gardens, Better Soups & Stews, 2003. 1. In a medium saucepan, in hot oil, over medium heat, cook 1 cup whole kernel corn, 1 small yellow onion, diced, and 2 cloves of garlic, minced. Cook until the onion is tender. Add 16 oz of broth. Bring to boil; reduce heat to simmer. Simmer, uncovered, 10 minutes, until slightly thickened. Stir in 1 cup dairy-free (or real) cream and 1/4 teaspoon pepper. Allow to cool slightly. 2. Place cream mixture in blender container or food processor. Cover and blend until smooth. Return to pan and keep warm. 3. 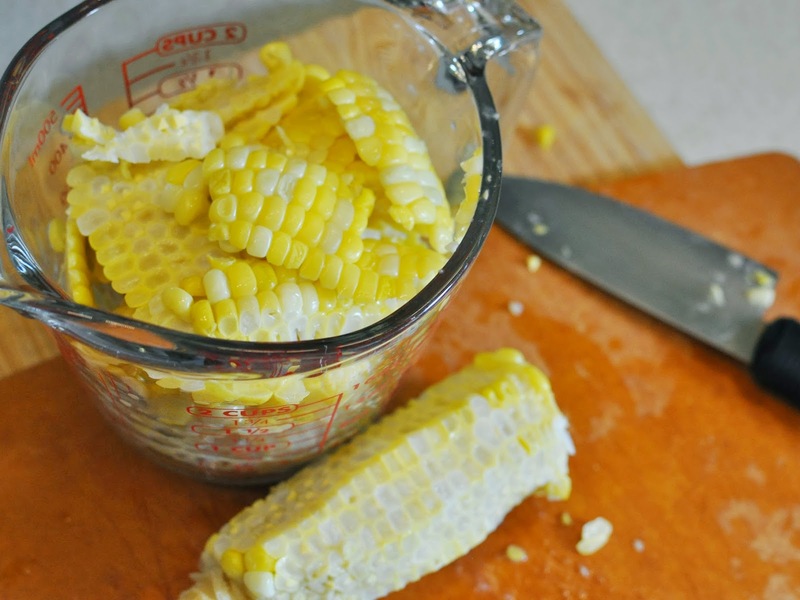 In a medium saucepan, cook 1 cup whole kernel corn and 1 large peeled and diced sweet potato until sweet potato is softened. Drain. Stir into cream mixture. Add 1 teaspoon fresh chopped parsley. Serve warm. North Carolina Home, collage & mixed media on paper, 9 x 12″, 2013. Do not reuse image without permission. Our Iowa home has something new and interesting to grace its spacious gallery-like walls – a collage. 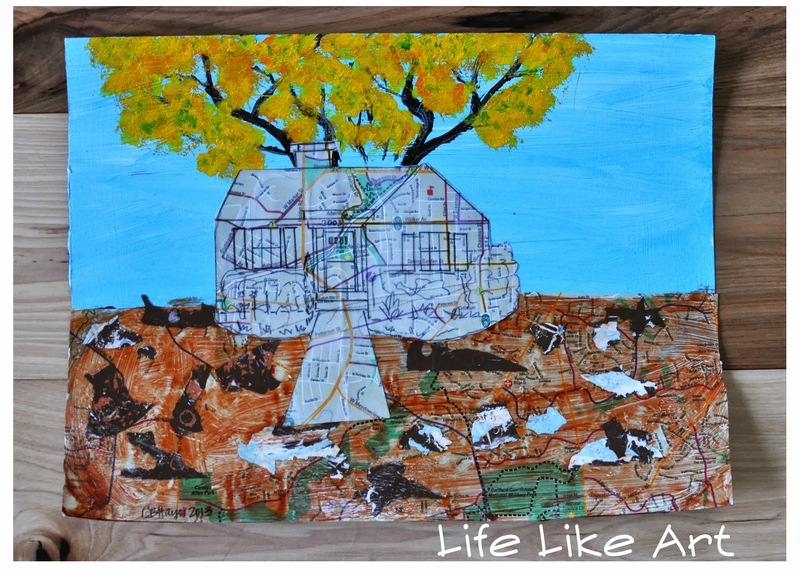 This collage makes use of old Greensboro maps, vellum, scraps of wall paint from the old house, and acrylic painting. Since this was our first home, I made this for Eric – coincidentally one of the first artworks I’ve actually made for him. Eric remarked on the house drawing, “Wow, I’ve never seen you use a ruler before to make art!” Hey, there’s a first time for everything. This right here is one of my favorite types of meals – roasted vegetables and fish, specifically salmon. I always start to crave this kind of meal when things start to turn towards autumn – even when I just think it is starting to turn. However, it’s still hovering in the 90s around here this week. Seriously, is it October yet? The roasted veggies are simply carrots, red potatoes, a red bell pepper, olive oil, peppers, garlic flakes, and fresh rosemary. 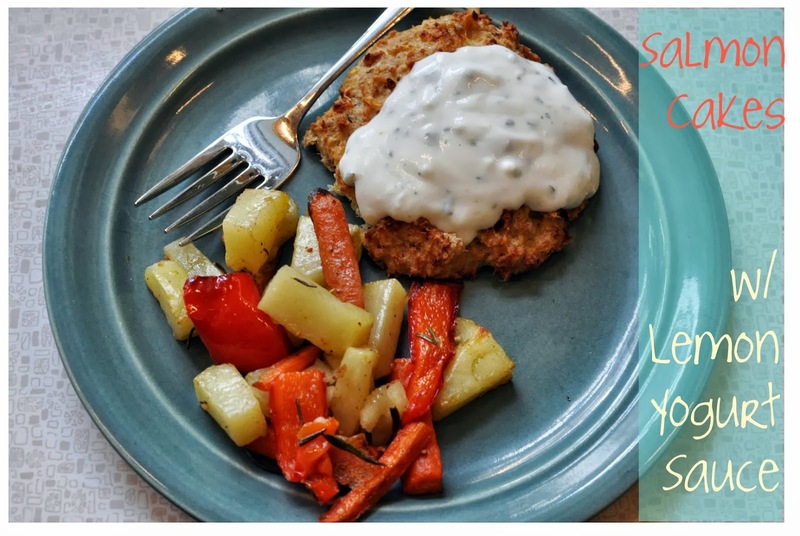 These babies are easy – so easy I had to remember to write down what I did tonight so I could actually publish the recipe! So much of what I cook is just on a whim and based on what looks right and feels right. This blog has forced me to be more observant and also created more consistency from each dish to the next. It’s also nice having my own personal portable cookbook to turn to no matter what home or coast I am on. 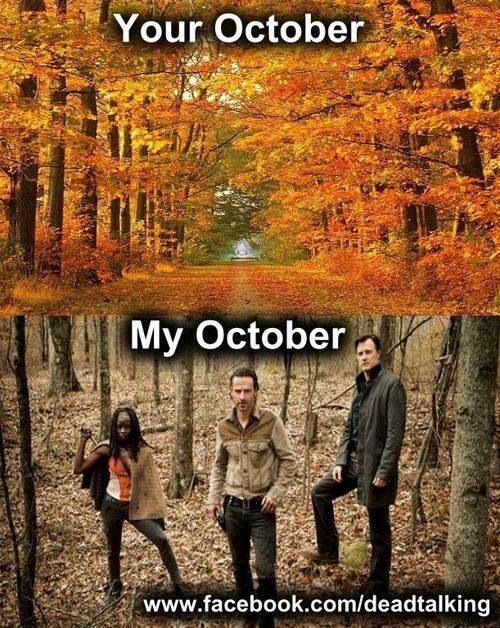 Is it October yet?! Stay tuned for fun Walking Dead ideas for all your Walking Dead party needs! 1. Preheat oven to 425 degrees. Spray an 8 x 8 inch pan with cooking spray or olive oil, set aside. 2. In a medium mixing bowl stir together with a fork, 1 – 14 ¾ oz can salmon, ⅓ cup panko, 1 teaspoon dill, and 2 eggs. 3. For sauce: mix ½ cup plain yogurt, 2 teaspoons fresh lemon juice, 2 teaspoons lemon zest, and 1 teaspoon chopped fresh parsley. Top cakes with yogurt sauce and serve immediately. 4. Bake 18 – 20 minutes, or until golden brown on top, setting the oven to broil for the last 2 minutes. Top cakes with yogurt sauce and serve immediately. Sometimes accidents are happy ones in the kitchen. I was trying to make dinner the other night and Greta was in the process of melting down – I simply waited too long to start dinner for her sake. I tried to make my favorite pizza crust, from memory. 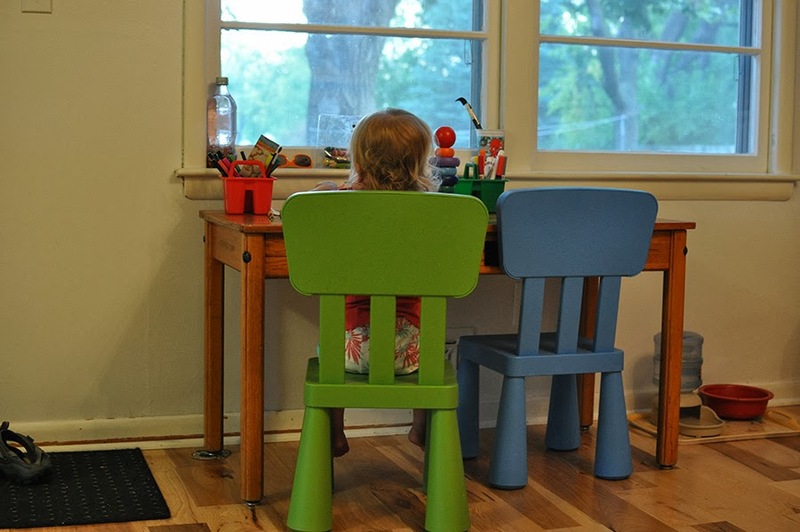 Usually this isn’t so hard, but when your toddler is screaming, it doesn’t work as well. 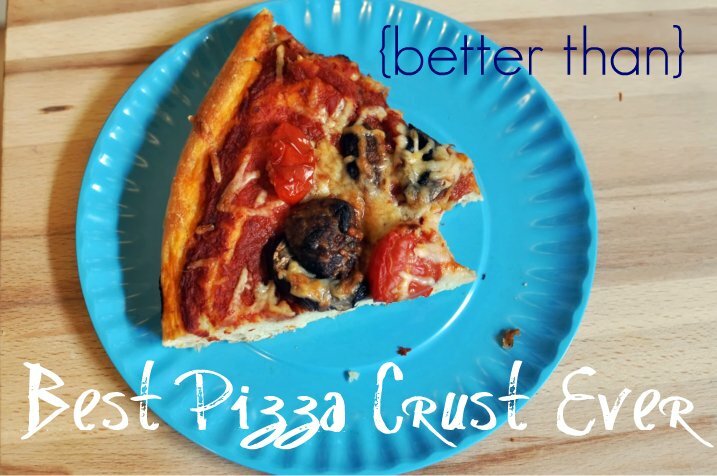 This crust appears in the previous post, Best.Pizza.Crust.Ever for dinner and knew as soon as I started to mix, that something was wrong. I decided to roll with it, modified a few things, and hoped for the best. I guess there was always the option of a sandwich and a can of soup if this failed. I realized I had doubled the water, so to compensate, I added more flour and some cornmeal. It ended up being so sticky that I did not knead it, instead stirring thoroughly. After rising (it filled the bowl!) I punched it down, coated my hands thoroughly in olive oil and spread it out on the cast iron pizza pan (works great on the grill, too!). When I baked the pizza, I used the convection setting to ensure it was baked thoroughly. 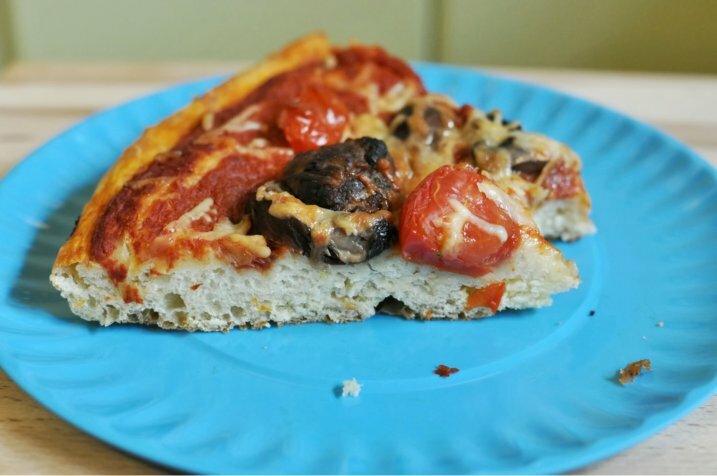 This crust turned out to be a fantastic deep pan-like crust that had a crispy exterior and a soft chewy interior. Eric having not been around for the mess-up, didn’t know the entire story. When he tried the pizza his first comment was, “Wow, did you make this? !” He said it was by far the best crust ever made in our house, so I quickly grabbed a pencil and paper and wrote down my error. Greta wasn’t all grumps that night, she has been enjoying a new art app I got for my classroom – called Drawing with Carl. 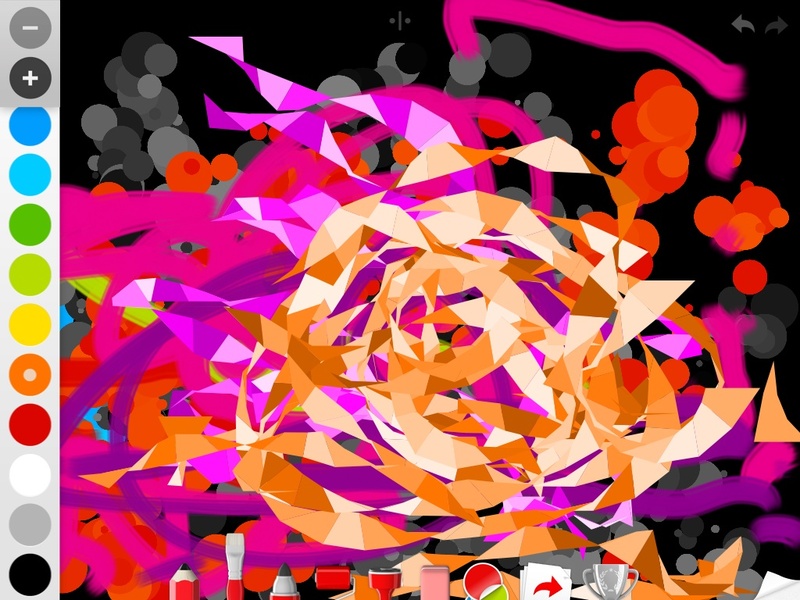 There are tons of neat paintbrush shapes to use – including this interesting pixelated one. There are roller brush patterns that turn into various patterns once drawn. Stamps create dots, stars, ink splats, and more. The icon with the red and green circle creates stickers of creatures, dinosaurs, facial features and more. The free version is very good – the upgrade offers more stickers plus a watercolor brush and oil pastels. I highly recommend this app for kids and adults alike. Eric always muses that I seem to like Drawing with Carl more than Greta does. Add dinosaurs is by far her favorite part of this app. 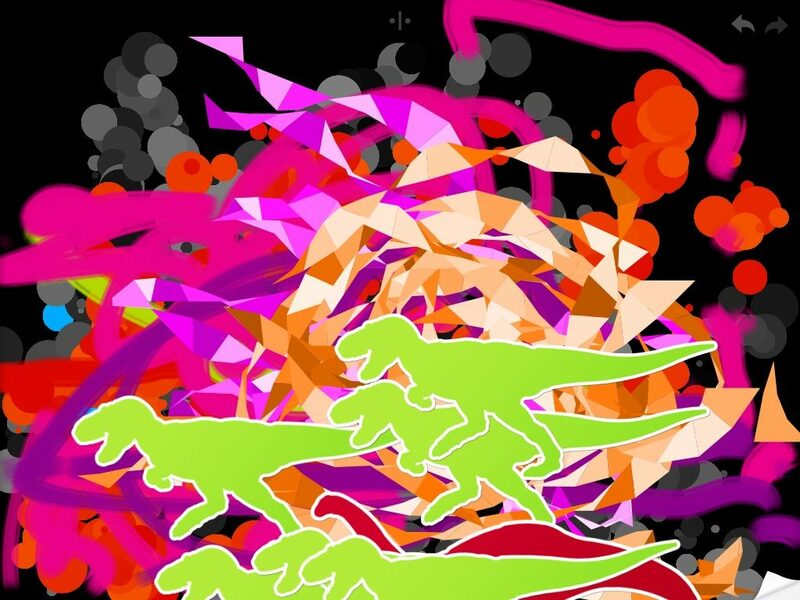 The dinosaurs and mammoth roar and make noises when added or moved around the screen. There is a funny little red guy with a big mouth – he has a neat feature too, but I will let you figure that one out for yourself. 1. 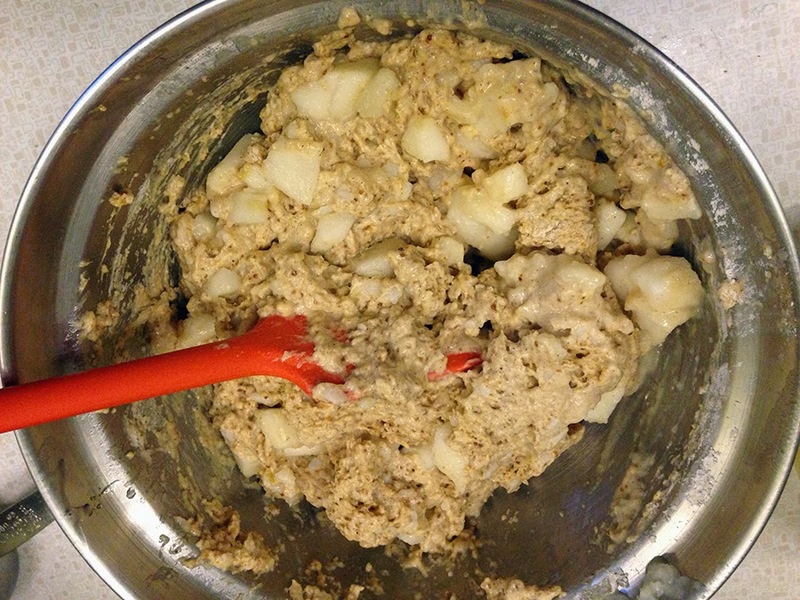 Mix flour and yeast in a bowl. 2. Mix warm water, olive oil, honey, and salt in a bowl or glass measuring cup. 3. Make a well in the dry ingredients. Add liquid ingredients and mix well – 5 minutes. 6. Punch down dough and let rest for 10 minutes. In the meantime, preheat oven to 425 degrees, on convection setting and prepare pizza pan with oil. 7. Coat hands in olive oil, remove dough and stretch into size on pizza pan. 8. Add tomato sauce to top of dough and bake on bottom shelf of oven at 425 degrees for about 10 minutes before adding other toppings. This will ensure you do not get the doughy, uncooked center. 9. While your crust is baking, prepare toppings. (For this pizza I used sliced fresh tomatoes, sliced fresh mushrooms, basil, minced garlic, and sliced spicy meatballs – real or fake work fine). 10. Bake pizza in 425 degree oven for about 12 – 15 more minutes or til done, on the lowest oven rack. Ok, so not cakes that are sweet, but nice little baked goods that are somewhere between a frittata and tater tot and oh so good. These babies were so good I made them two nights in a row at our house! 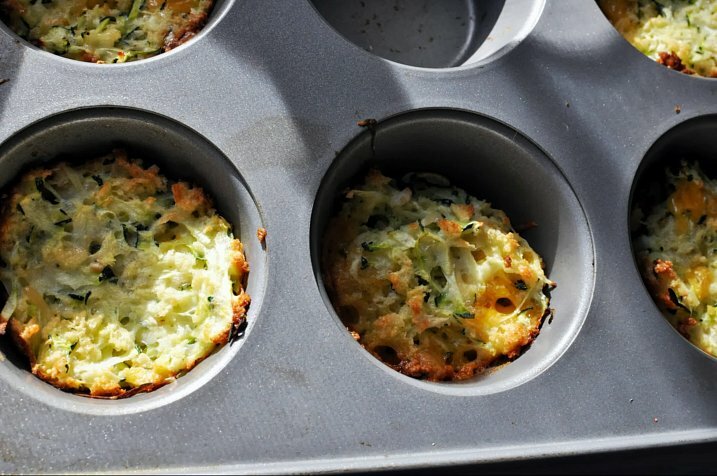 I still have loads of zucchini to use up – so of course the zucchini recipes are still coming! I have quite a bit of zucchini in the freezer right now, just taunting me. 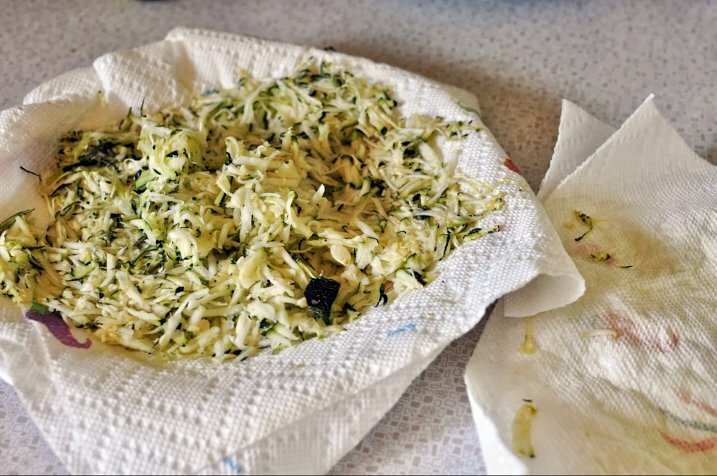 The first part takes planning and is crucial – allowing the zucchini shreds to dry out between layers of paper towels in the fridge, at least overnight. This way your finished zucchini cake isn’t a soggy mess. Mix the ingredients together in a bowl. I used cheddar chunks one time and cheddar shreds the second, both were equally tasty. Fill 12 sprayed muffin cups. Bake until golden – 15 – 20 minutes at 400 degrees. You should end up with a dozen ½ full muffins or cakes. 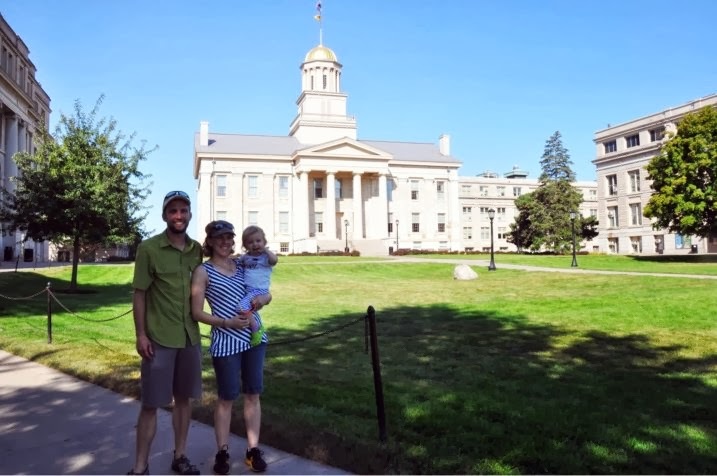 Part of our Labor Day weekend was spent in Iowa City – both Eric and I are Hawkeyes, so it was fun to get back to that town for a day. 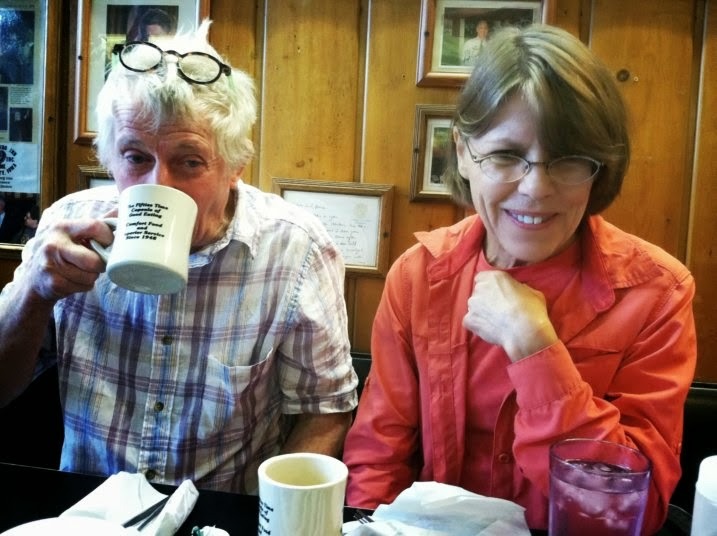 We met my parents there and started off with a hearty and delicious breakfast at the Hamburg Inn No. 2. It is a well known spot for college students, locals, and travelers alike – also a common presidential stop. Their pie milkshakes are world-famous. 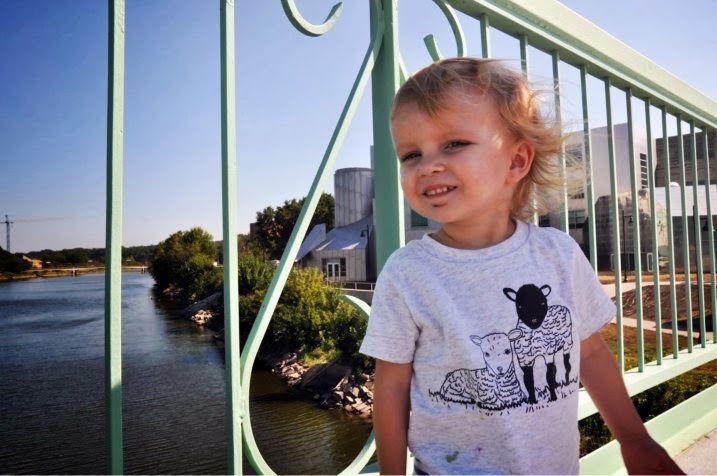 Greta loved the bridge over the river to the art building. So many treks were made across there in all kinds of weather. We made a stop in the Macbride Hall Museum of Natural History. This museum is free and rivals the best museums in the biggest cities. 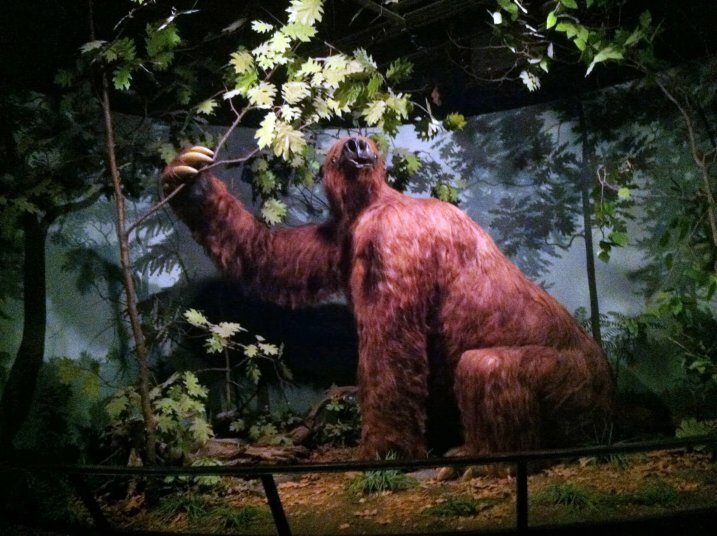 The dioramas are superb, the giant sloth is frighteningly large, the mammal hall impressive, and the bird hall chock full of a dizzying array of all things feathered. We made a trip to the Macbride Raptor Project, which is about 25 minutes outside of Iowa City near the reservoir and Sugar Bottom. 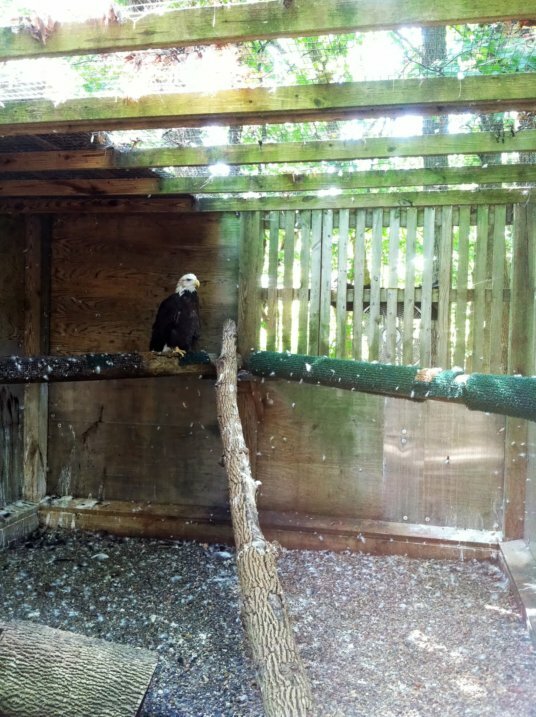 Again, free, and completely worth the trip – the birds housed here are either unable to live in the wild due to injuries or human imprinting. We ended the holiday weekend by drying more tomatoes. Greta is my helper with removing stems and washing. 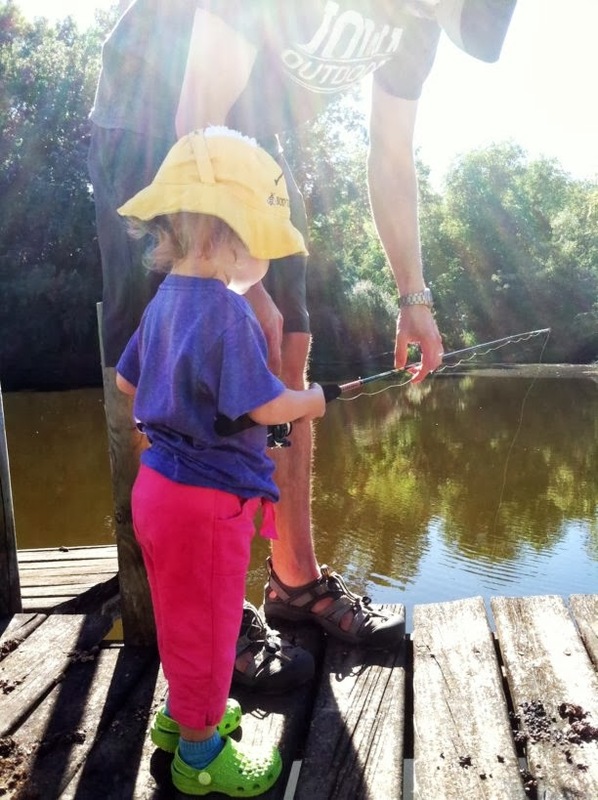 An afternoon fishing trip at my parents’ pond was the best end to a near-perfect weekend. 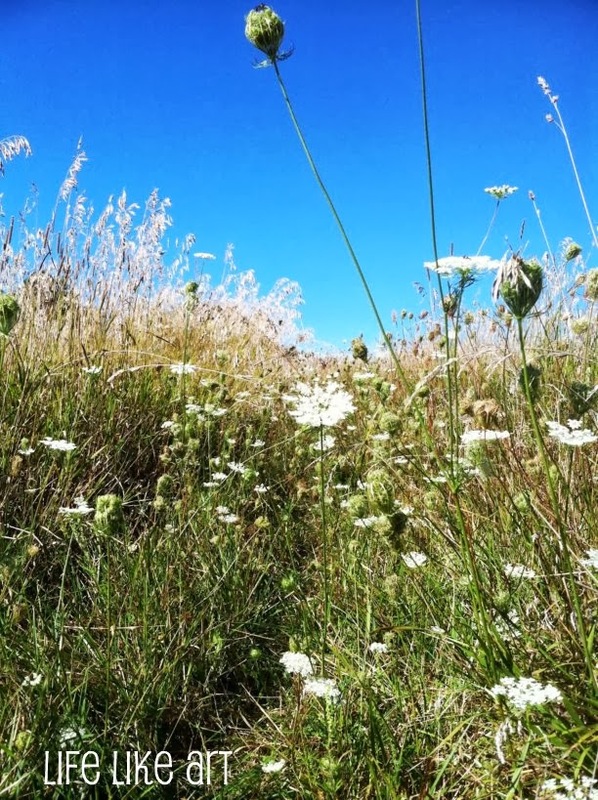 This photo sums up my love of a perfect summer, almost fall day. Does it get any more gorgeous than this? 1. Shred 2 cups of zucchini. Spread in a plate, between layers of paper towels and refrigerate overnight. 2. 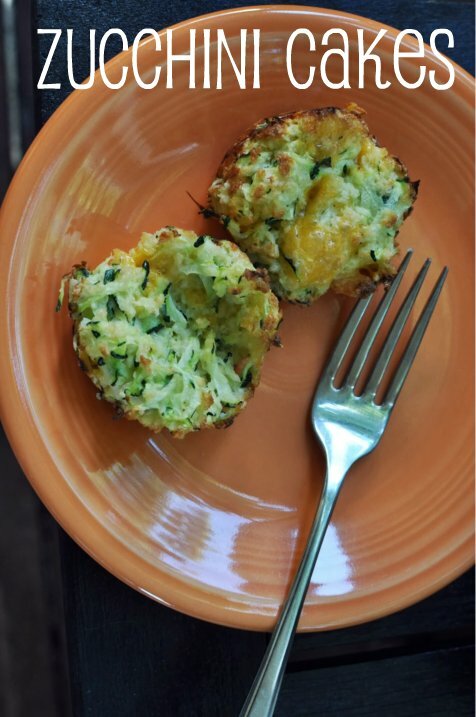 In a mixing bowl, mix together 2 cups zucchini, 1 cup panko, ¼ cup shredded cheddar cheese, ¼ cup shredded Parmesan cheese, 2 cloves minced garlic, ground pepper, and 2 eggs. 3. Grease 12 standard muffin cups. 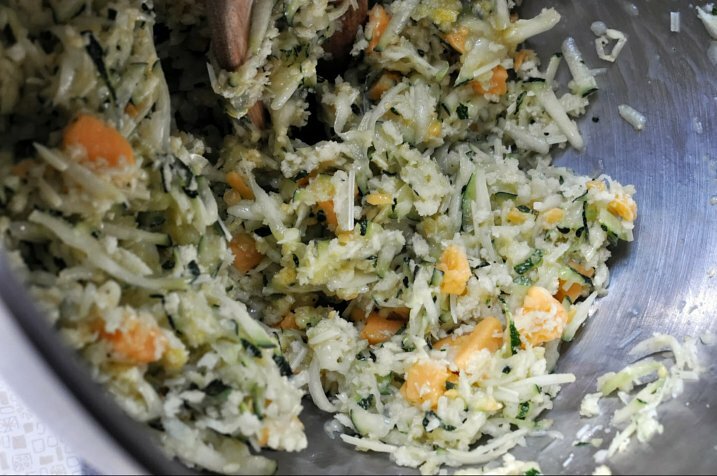 Fill 12 cups with zucchini mixture – should be about ½ full. Bake in a 400 degree oven for 15- 20 minutes or until golden on top.